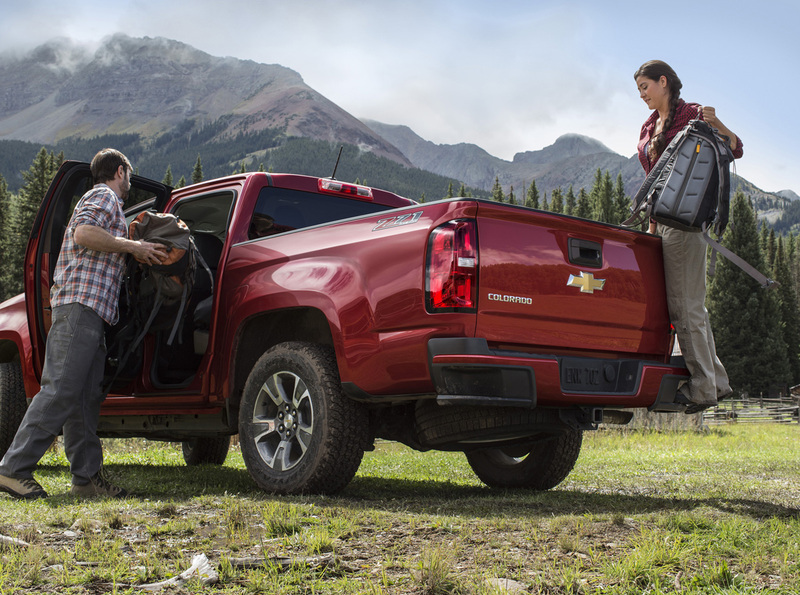 New for this year, the 2015 Chevrolet Colorado is a midsize truck that is larger and more capable than its rivals in the midsize market. That has good and bad points, as we’ll see. The chief attributes of the Colorado that set it apart are a more spacious, comfortable interior, a smooth highway ride, and great exterior looks. 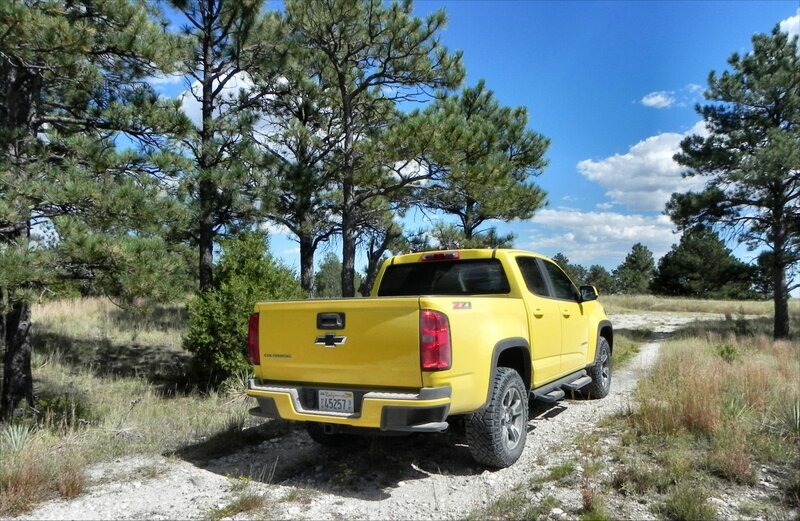 We drove the 2015 Chevrolet Colorado Crew Cab with its Z71 Short Box 4WD Trail Boss package for a week and enjoyed the versatility it offered. The 2015 Colorado brings a lot to the table, but midsize truck shoppers will want to know what they want out of a truck before they buy. The Colorado has plenty of excellence, but leaves a lot of room for its rivals to remain competitive. 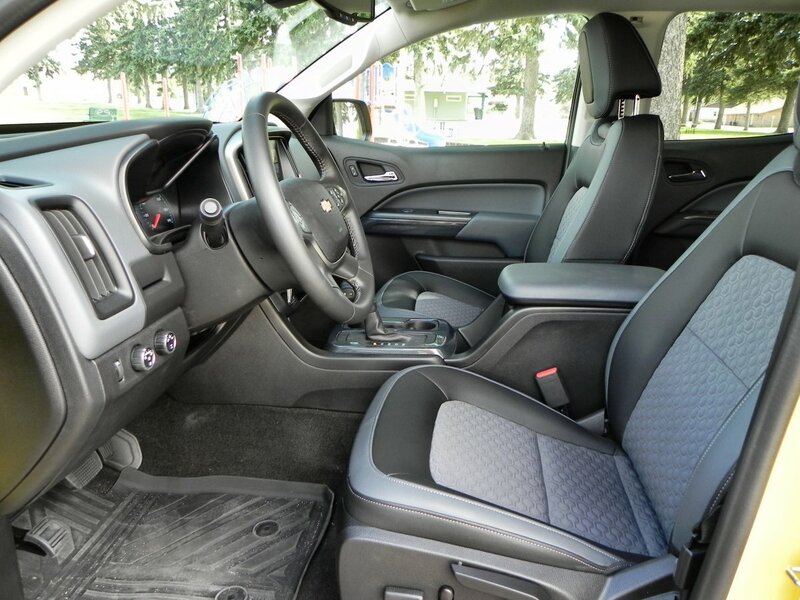 The Colorado comes in extended and crew cab body styles with seating for two, four, or five. Bed lengths come in short and long along with five trim levels starting with the Base and finishing with the top-shelf Z71 as we drove it. 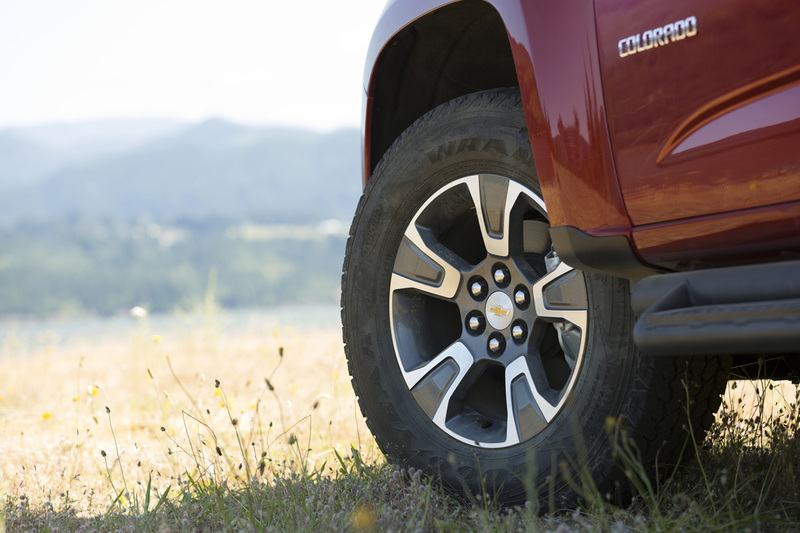 There’s no argument that the exterior of the new 2015 Colorado is sleek and tough. It sports a look that promises sturdiness and fun at the same time. 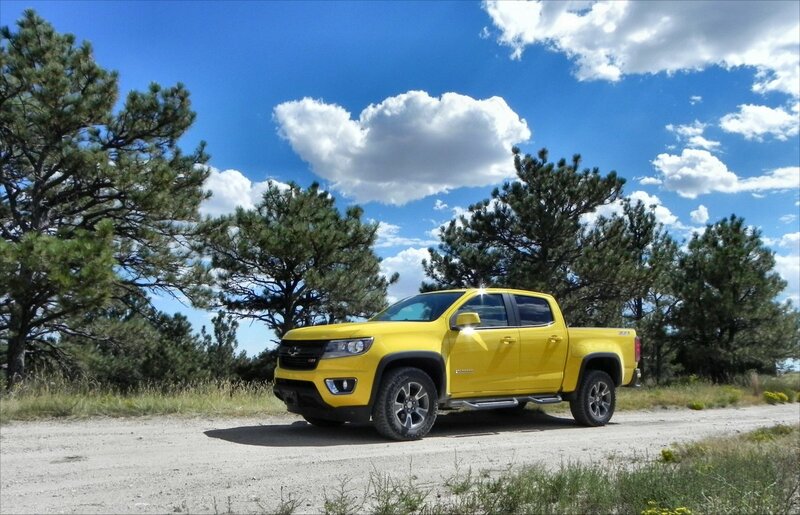 Unlike other General Motors’ trucks, the Colorado does away with most of the square boxiness that defines their shape in favor of more flair and sportiness. Signature Chevy Truck elements remain, of course. 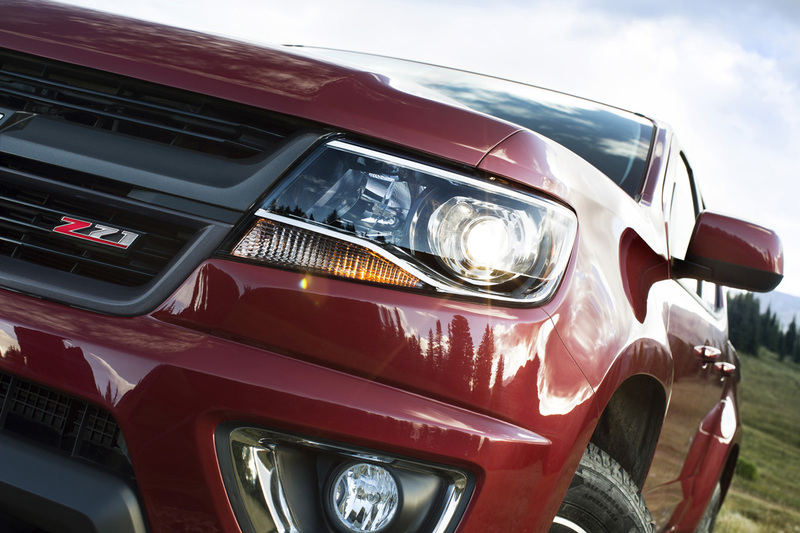 The Chevrolet Colorado begins with a simpler, single-bar grille and more angular headlamps. The fog light bezels are angled opposite the headlamps above, offsetting them and accenting the lower bumper on the fascia. From the side, the square wheel wells of the other GM trucks are there, but are not reinforced by the square box fender flairs but instead by rounded, more skirt-like flairs for a sportier look. An upward-trending cut below the doors follows below the same trend in the beltline, making for a more coupe-like profile and greenhouse. At the rear, the rectangular tailgate has a deep bezel to create a larger spoiler effect on the top. The rest of the rear end is all business, with a bumper that promises Chevrolet capability, including the bumper steps and bowtie badge. The 4×2 models have a slightly lower ground clearance and less space between the tire and the wheel well while the 4×4 packages have beefier tires and more clearance at both points, though they are not perfect, as we’ll see. Those counting will note that the new Colorado is much bigger than either the Tacoma or the Frontier in both length and width and is actually a couple of inches longer than a full-sized, single cab Silverado as well. This means it handles, drives, and parks like a full-sized truck in many ways. 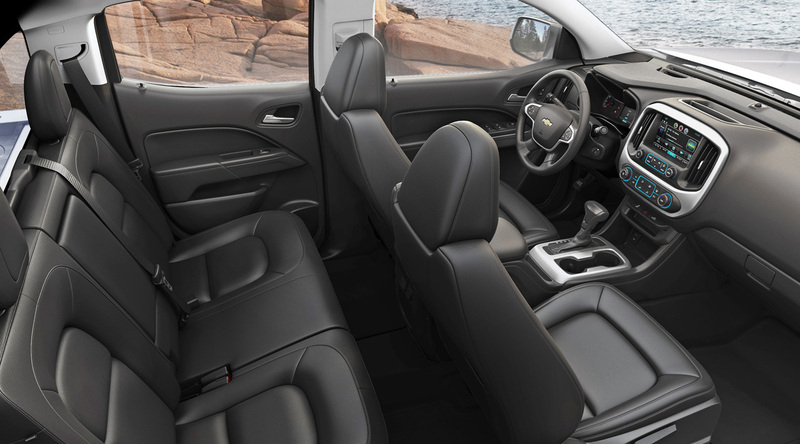 The Colorado has a far more modern interior when compared to its rivals. At the base level, its controls and instruments are more intuitive and generally easier to read and the ride is quieter and more comfortable overall. 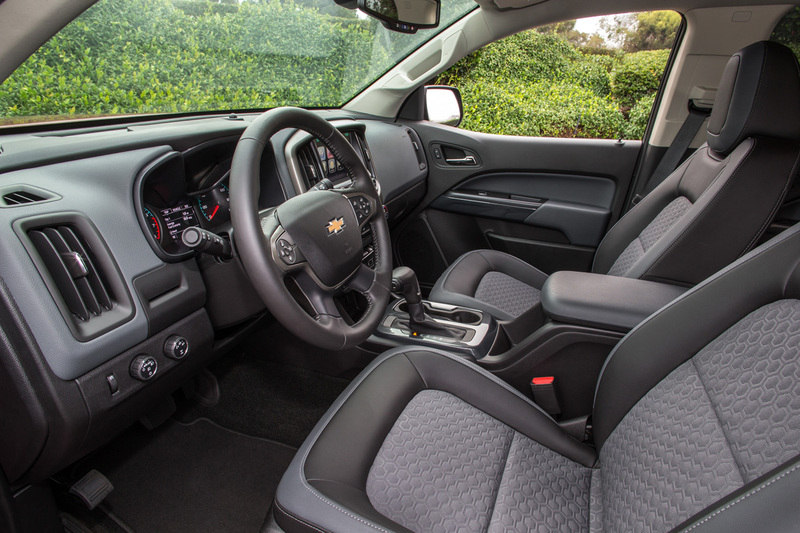 At the upper levels, such as with our Z71 test model, the 2015 Colorado’s interior is head and shoulders above the top-level competitions’ packages. 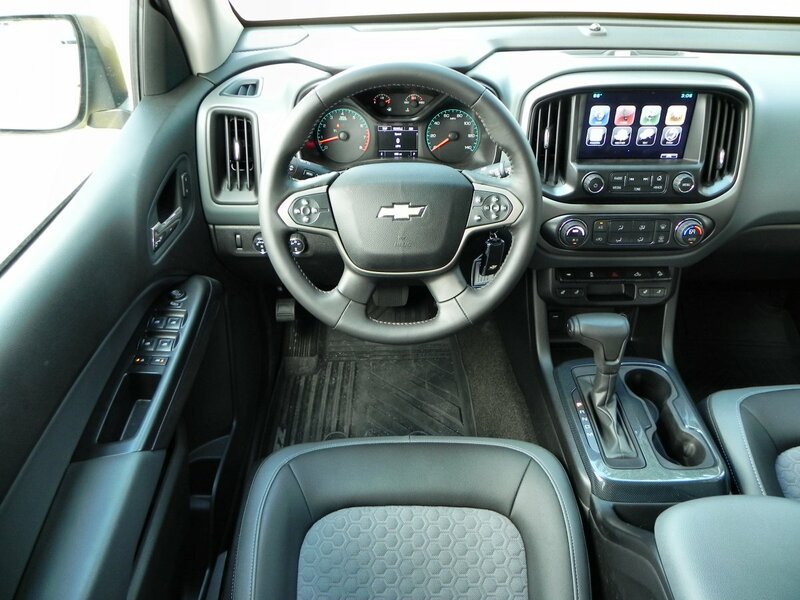 By comparison, inside and out, the 2015 Chevrolet Colorado is bigger in nearly all dimensions, which translates to more interior room. Add to that better seating, a more ergonomic interior layout, and a more upscale design overall. A few smart ideas in the Colorado come forward as you explore its interior. In the extended cab version, the jump seats can have their headrests removed and installed at the bottom to make them large enough to accommodate a child safety seat. That’s smart thinking. In the crew cab, the rear seat bottoms lift to expose integrated storage boxes for gear best left out of sight. 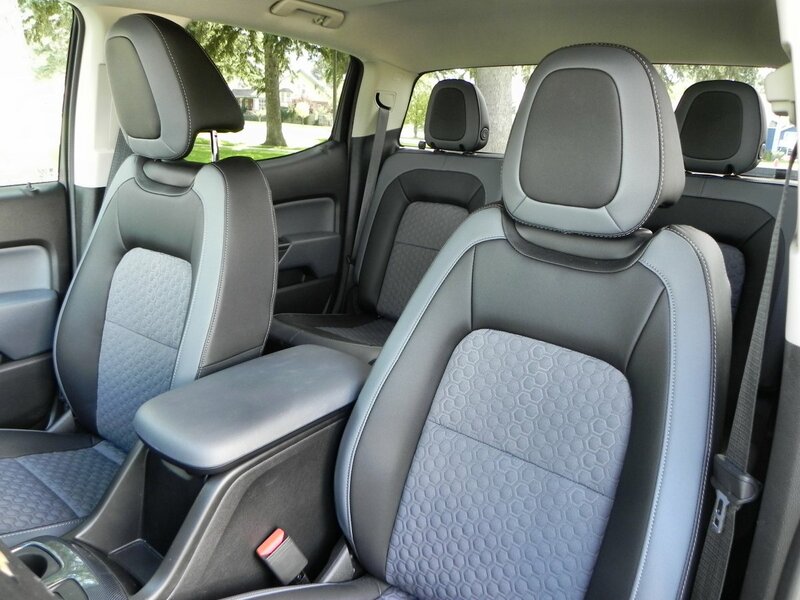 The rear seats also fold forward to give access to anchors for the top tether on a child safety seat.The rear seating in the 2015 Colorado with the crew cab is comfortable, even for adults. 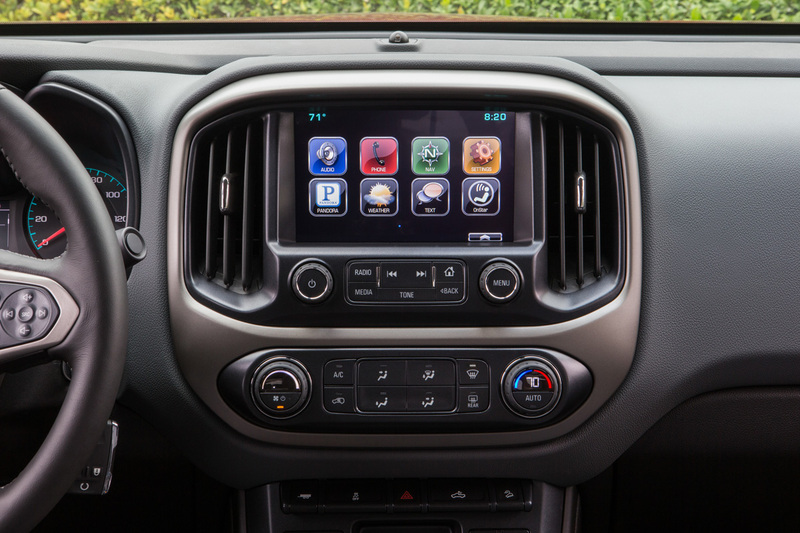 Infotainment in the Colorado centers on the standard 4.2-inch touchscreen and the MyLink app system. Upper trims or packages bring an 8-inch touchscreen, which is far easier to use. Various options for MyLink include OnStar telematics, the integration of various smartphone apps for music streaming, an available 4G WiFi hotspot, satellite radio, voice controls, and more. We have always found the Chevrolet MyLink system to be usable, with a relatively low learning curve. The cargo bed in the Colorado is wide and high, making it a boom and bust depending on your needs. Those who prefer smaller trucks for their reach-in capability to easily access the cargo area without climbing up with be disappointed with the tall sides and high ride height on the Colorado. On the other hand, this makes it easier to haul bulkier items and the easy-lift and soft-drop tailgate on the upper trims is a very nice feature not found on other midsize trucks. The long bed, with its tailgate down, totals eight feet almost to the millimeter. 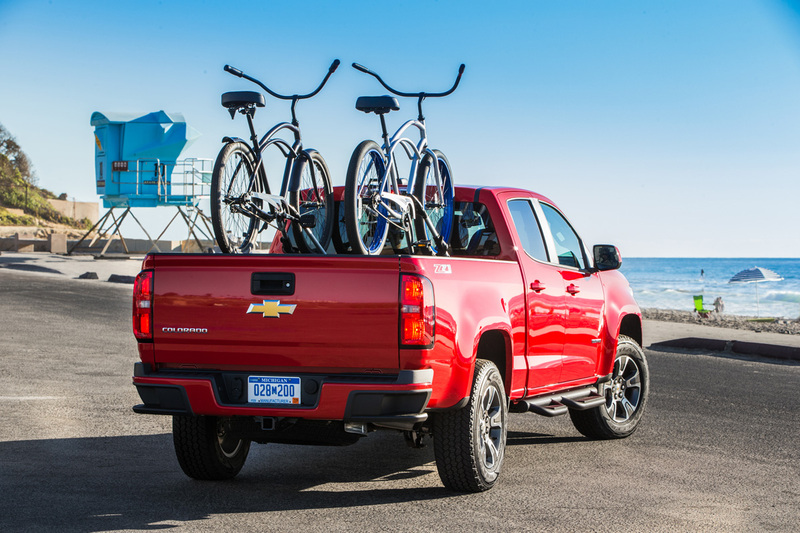 The Z71 package includes a load locking system that we found to be complicated and limited in usefulness compared to the great sliding tie-downs and movable load locks offered by both Nissan and Toyota on their little trucks. On the other hand, the integrated bumper steps are a nice addition to the Colorado. There are two engine options for the Chevrolet Colorado. The base engine is a 2.4-liter four-cylinder that outputs 200 horsepower and 191 pound-feet of torque through a six-speed manual (two-wheel drive only) or six-speed automatic (available for 2WD and standard on four-wheel drive). The four-cylinder engine is rated at 3,500 pounds for towing. The EPA gives it a 22 mpg combined rating for 2WD with either transmission and 21 mpg with 4WD. The other engine, which is the one we drove, is a 3.6-liter V6 that outputs 305 hp and 269 lb-ft of torque. 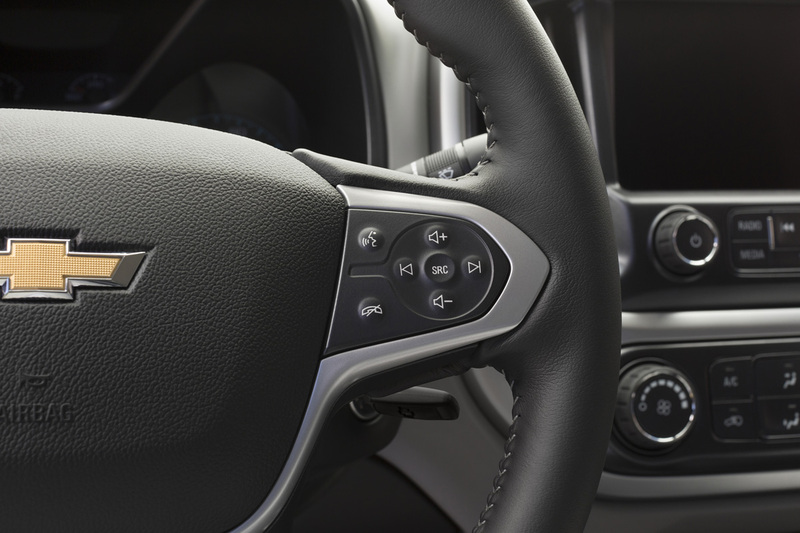 This comes only with a six-speed automatic transmission and is available in either 2WD or 4WD. Maximum towing, when equipped, is 7,000 pounds and the V6 Colorado is rated at 21 mpg combined in 2WD and 20 mpg combined in 4WD. For the base model, the four-cylinder is enough to get the job done if getting around town or carrying light loads is the only job the Colorado is required to do. It is underperforming in most ways, however, and the upgrade to the V6 comes with little fuel economy sacrifice in return for the far higher number of horses it brings. 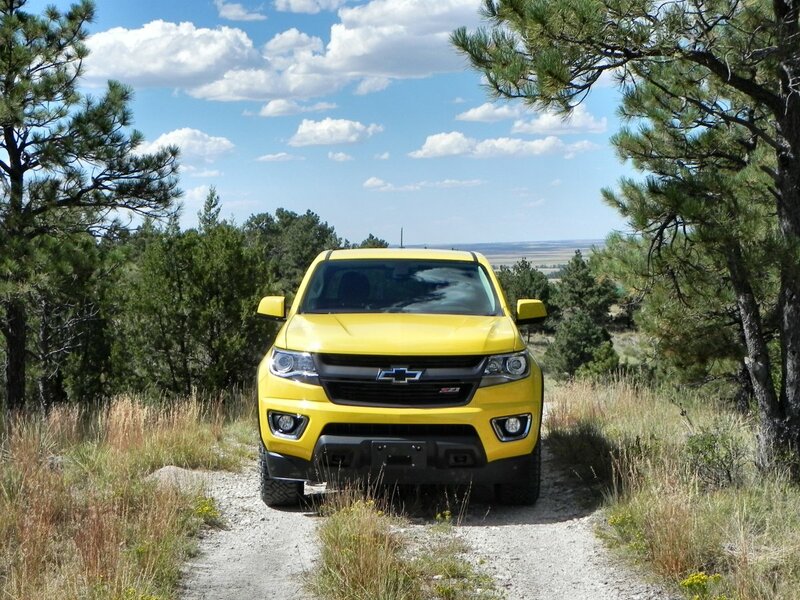 On the road, the 2015 Chevrolet Colorado is a smooth, comfortable, and well-mannered drive. Like its larger siblings in the General Motors truck lineup, it’s refined and sharp on pavement. It’s also very quiet in comparison to rivals, especially on the highway. Even with the beefier offroad tires ours came equipped with, the Colorado showed itself to be much quieter and easier to drive on the freeway than have the Frontier or Tacoma. Around town, the superior maneuverability of the Colorado also shows through, with its tight turning radius and standard-issue backup camera being big bonuses to parking. Our test model carried the Z71 Trail Boss package decals and equipment, which includes added wheel flair accents, offroad tires, a towing package, and a lot of small additions such as rubber floor mats, a spray-on bed liner, and other dealer-installed goodies. Astute readers will note that this list does not include changes to the suspension nor the addition of other offroad gear such as a skid plate. In fact, the low-hanging air dam for improved highway airflow and fuel economy remains on the truck. This greatly impedes ground clearance and gives the 2015 Colorado almost no approach angle for hill climbing and mud slogging. This low-key off-track package adds little to the Colorado’s capability in the dirt. Compared to rivals with their offroad offerings, the Colorado brings little competition. It has superior towing and on-road presence, but has little capability when it comes to carving your own trail or getting to the hard-to-reach campsite. 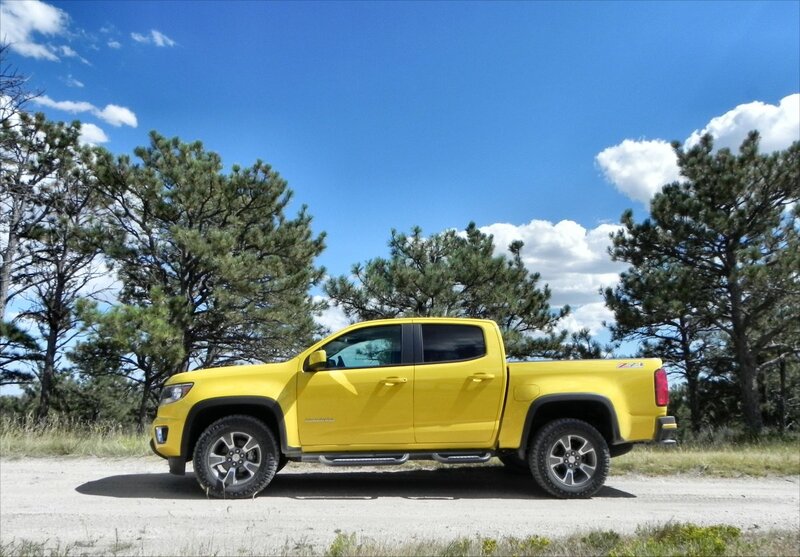 For us, this meant that as it is, the Colorado would require extensive modification to be on par with the Nissan Frontier Pro-4X or Toyota Tacoma TRD Pro packages that are priced about the same as the Colorado’s Z71 Trail Boss. 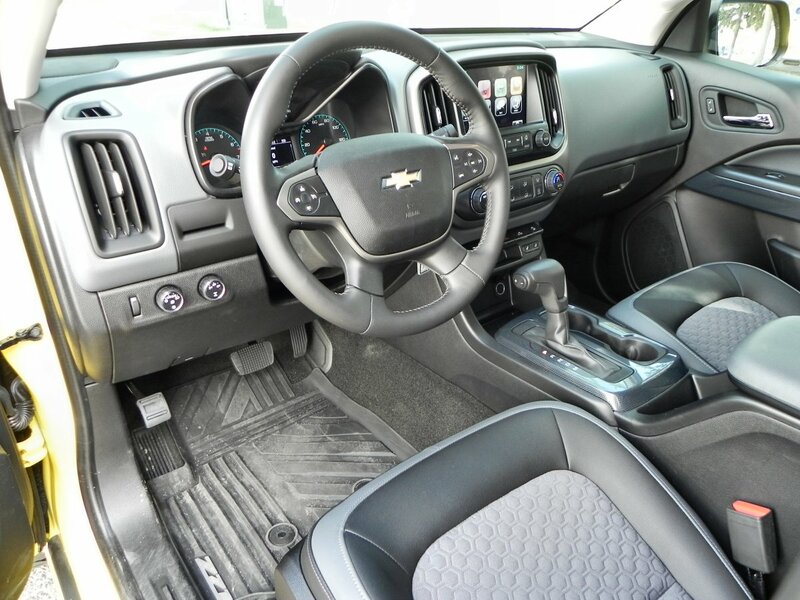 In all, the 2015 Chevrolet Colorado is a well-built, well-designed truck with a lot to offer midsize buyers or those who may not require a full-sized pickup. If your plans are primarily off the road, you may wish to look elsewhere, but if you drive on roads and highways, around town, or otherwise need a truck to haul people and stuff, the 2015 Colorado is a great choice. It does have a price premium over similarly-equipped rivals, but offers more interior space and a larger cargo bed in return.